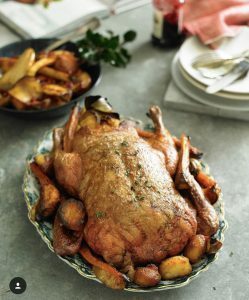 Roast Duck is a quintessential Christmas classic and a fab alternative to Turkey! This recipe is a little different from your usual roast duck, We’ve used a boned whole duck and stuffed it with some wonderful, punchy ingredients that are just bursting with festive flavour! bowl and mix thoroughly. *Season with the grated Nutmeg and Salt & Pepper. the centre of the duck. kitchen string before tying off at one end. 4. Turn over and place in an oven dish and arrange the Duck bones and giblets. 5. Cover and place in a pre-heated oven (220oC, Gas Mark 7). and turn a lovely golden brown.